Xiaomi has become the number one smartphone vendor in India in Q3 2017, as per IDC’s latest Quarterly Smartphone Tracker, Q3 2017. 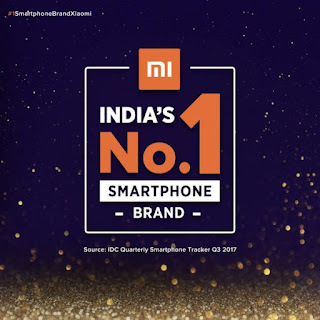 According to IDC, Xiaomi has a market share of 23.5% and having shipped 9.2 million smartphones in the quarter, Xiaomi has climbed up the ladder to become the number one smartphone brand in India. The company has also become the fastest growing smartphone brand in India with a growth rate of nearly 300% percent year-on-year which is great achievement for any brand. You may recall that Xiaomi started its journey in India by selling its products via online channels only. But of late, it has penetrated in offline business through Large Format Retailer partners, Mi Preferred Partner stores and Mi Homes which has resulted in doubling of its offline sales in Q3. The company also continued its leadership in the online smartphone market with a significant 51% market share. Xiaomi’s phenomenal record of four million units sold between 20th Sep to 19th Oct, combined with the unparalleled success of Redmi Note 4, Redmi 4 and Redmi 4A, has contributed considerably to the company’s rapid growth as stated by the company in its press statement.